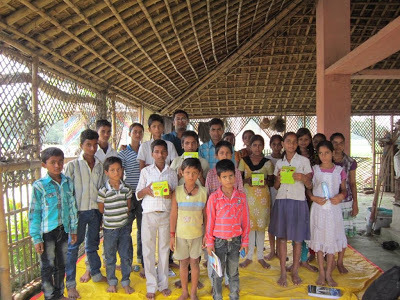 As mentioned earlier, children at PRAYOG’s baal bagicha wrote essays on three topics: mid day meal tragedy at Chapra, a letter to mother earth and the world of their dreams. We had to meet on August 10 and 11th to share the essays and decide on the best 10 essays as well as select 5 children who would be sent to a week long exposure visit in October. On 9th evening, I got numerous calls from children whether I am visiting them or not. Their sweet voices echoed throughout the journey next day. 21 children (9 girls and 12 boys) participated in the event. 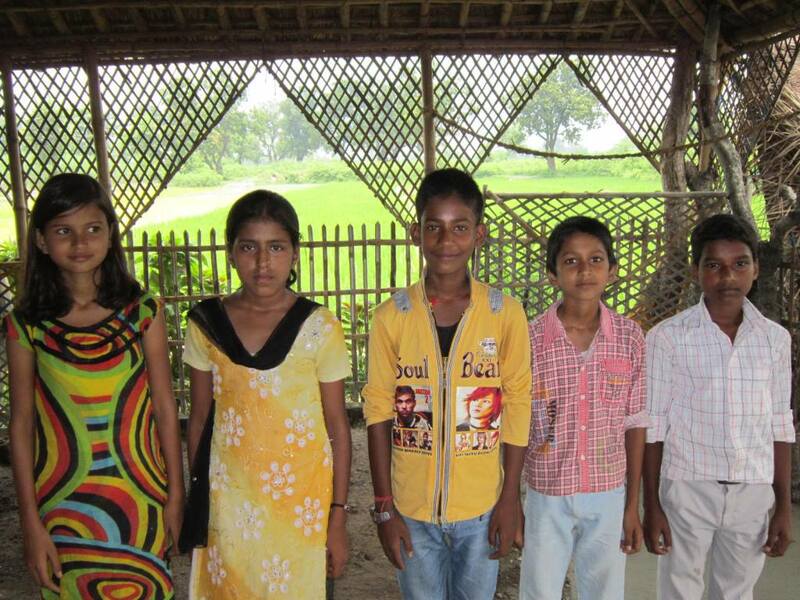 Some of the children were out-of- village for personal work and could not participate. 14 children wrote on the above three topics. While the maximum coverage was on mid-day meal tragedy at Chapra, only one essay was on the world of their dreams. This was by a dalit boy. The essays reflect a sense of empathy in the children. A dalit boy writes about his dream and fantasies but is realistic enough and mentions that ‘he wakes up and finds himself on his bed, the world of dreams is very sweet’. The question now arises is whether individuals/ institutions / organizations are actually working to convert the dreams of so many Pankajs into reality. Brijesh realises that earth is bearing the burden of man’s atrocities but is still calm. In his letter, he has a sense of gratitude and thanks the earth for giving everything to us despite the spurious nature of man by reciprocating with exploitation of these resources. Ayush cited various reasons why the mid-day tragedy took place at Chapra and according to him negligence was a major factor. He then suggests that provision of trained cooks/ additional cooks, packed foods could prevent the occurence of any such incidence. Ayush also comments that Government should de-burden the involvement of Pricipals/teachers in mid-day meal activities as they cannot perform their prime duties because of this. 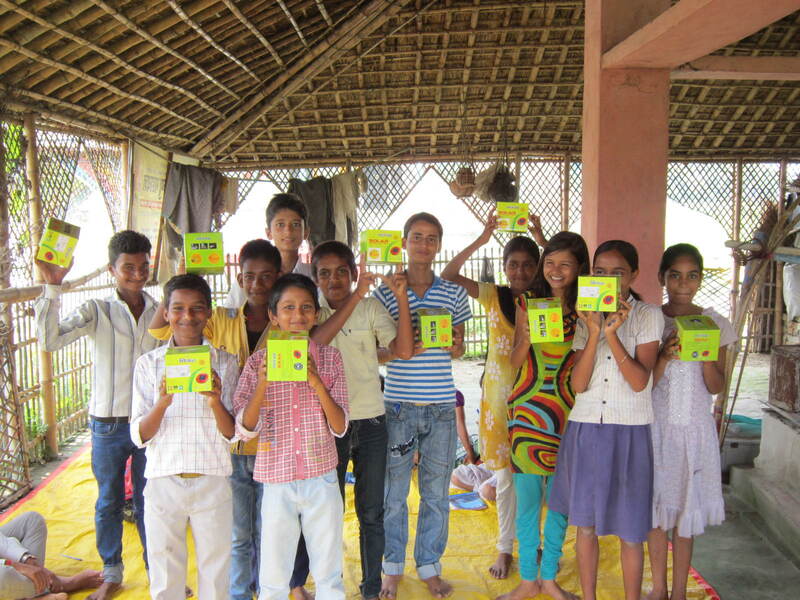 It was informed to the member students, each of the 10 best essays would receive solar study lamps as a prize. But, 11 essays were selected. How did the 11th child get this opportunity to win the prize? The essays were judged only on the basis of their vision and content. 11 essays were shortlisted as 2 of them scored equally. But, the total number of prizes was only 10. When the result was declared, one Aakash Kumar agreed to share his prize to the 11th student as his siblings had also won the prize. The 11 students were then given some time to prepare for a debate on their topics. There were 3 judges and 4 elderly from the village also participated quite vocally in the event. Towards the end of the event, 5 students were selected for the proposed exposure visit in Siwan for a week long rural immersion program. The students also proposed that there would be a weekly meeting whereby they will discuss on requirements of books, tuition or any other relevant activities. 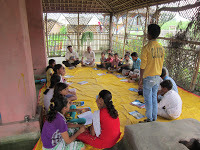 A motivating incident for PRAYOG: While we were about to end the session, 3 girls from the nearby dalit tola came on their own and expressed their willingness to join the library. One of them, Pooja Kumari who is pursuing her graduation (home science) informed that she came to know about this initiative from her elder brother. She and some of the other girls of her tola then visited the library and entered their names in the library register on their. They read some of the books and also took back some of the books to their home. But, someone in her tola informed them that these books are not to be issued and meant only for reading in the library site. The girls then immediately returned the books. We at PRAYOG are excited to learn this response from the community. The response teaches us how effectively a library be managed by the community. The library is at a open space. In term of infrastructure, there is a steel almirah, a box, some games equipments like badminton set, canvas balls etc and of course 50 books and 10 periodicals. 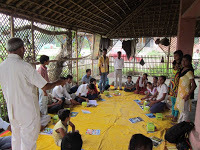 We are now trying to expand the number of books and other reading materials, which is easily possible. Thanks Avijeet! Trying to improve and there is immense scope to nurture the rural children, infact. You are doing a great work… Really impressive!! Good luck!! This is excellent. I went through all the essays. The children have done very well in expressing what is on their mind. These activities and wins will boost their confidence in themselves and improve their thought process. Thank you Shipra for understanding this initiative and its long term impact. Appreciate! Abhishek, waiting for your turn to volunteer! I absolutely agree. Let me inform you that in today's meeting via telecommunication, 10 new faces registered in the library. We are also starting night classes from next month which would be used for introducing computers in their life. Challenging, though excited! This is just wonderful! I am overwhelmed by the mixed group you are working with, Dalit boy 🙂 and Girls selected for exposure trip. I just wish maybe next time I would see more of 'kumari' essays! Simply great work! Jaspreet, I am overwhelmed by the response of the youth there. As of now, we have more than 40 members from 4 schools and 3 different villages. And almost everyone has joined through peer reference, PRAYOG has not approached anyone to join. Yeah, probably the 'kumari' letters would be posted soon. Waiting for their letters written to teachers on the coming occasion of teacher's day!